It was a debauchery of drinking and canning this weekend. Friday night's drunkeness with Lance, ME and friends ended at about 3 AM after a quick visit by yours truly and Lance to Dave's place of work. It's amazing how much a horseshoe shaped street can really mess with a mind that's liquored up! Then finalizing the night with some very pathetic pool playing before crashing. Saturday morning was a trip to the dermatologist for a quick 8:15 am check up. Yes, I know my eyes are bloodshot, but aren't I here for my skin? Ugh, that was enough.... home to bed! Got up at about 2-ish and shortly after went down to Eastern Market mostly to get some black cherries. I did get the cherries plus a few other things: A pretty bundle of Glads', a yellow plant of some sort, and a vendor was clearing out his peaches for $1 a case. Yes, a case! Cha-ching! Oooh oooh, I'm gonna can some peaches. Oh wait, the side of the box there says nectarines. Hmmm. Well, still a good deal and there has to be a zillion things you can make with nectarines too. After Googling like mad I found several recipes and instructions for canning them albeit the instructions were for using pressure canners rather than a water boiling canner - such small details. 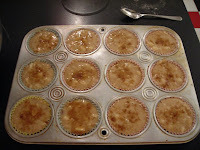 I made some awesome nectarine muffins which I found at the All Recipes site granted the recipe is suppose to be both nectarine and peaches but what the heck they are quite tasty! I bet these would be good with a little lemon and blueberries. 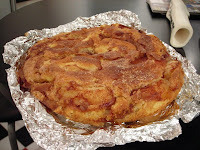 I also made a Spiced Nectarine Cake which is very very tasty, but just a little wet. I'm still pondering over how to arrange the nectarine slices in a concentric circle. I wonder if I'd made my circles of fruit with the tips facing the sides rather than the middles if the sides would have held up better. Very good nonetheless and I wouldn't hesitate to make them again. Well that used up ohhh about 12 of the 40 or so nectarines. I canned 3 quarts which is to be determined at a later date whether or not that is a good idea; I do have that fear of one of my jars exploding and creating a huge mess... will one of these be the one? Canned nectarine update: I used 2 of the cans for various thing, but they didn't have the right consistancy and I wound up dumping the 3rd jar. It wasn't a complete failure, just not as good of a result as I'd hoped for. I gave 6 to the neighbor and 8 to Lance. There's about 20 still in my fridge... maybe I'll make more muffins for the GLR trip? Maybe some nectarine smoothies are in the future for this weekend. I wonder if I can freeze the slices for a short period of time. Oh, I also canned 6 jars of the Black Cherry jam, which I've come to really enjoy with toast. Sunday was the "Free at Last" hash hared by Coxcycle in South Lyon prior to which Mark, Katie and Dave ran 12 or so miles. It was a good time and we all were eager to run up the tab at this uncommon "no hash cash" event.